I didn't open my WL rewards packs yesterday just because I knew these were dropping. I'm so stoked - I can't wait to get off work, go home, open those packs, and not find these guys in there. Whoever determines the position of madden cards should honestly get a new job. Like keep things consistent and take theme teams to consideration. That said this 2 Ltd a day for honors is a sad attempt to give us daily content. Is there a reason why every DE is a LE? Thats it?? Where are the rest of the nfl honors players? Exactly!!? There were more players honored than just the basics like...where's Ben garland? Man! 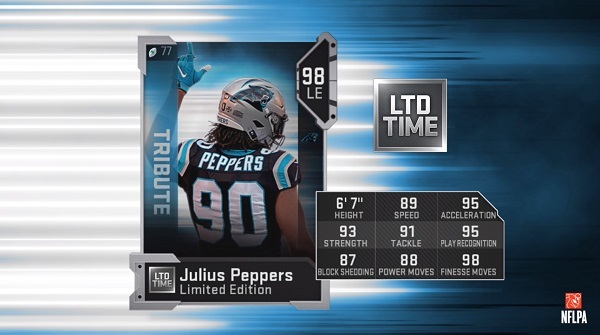 That Peppers looks very good!!! Releasing them daily. All will be LTDs, as MUT is now pay to play, so they will be cards most can't get.